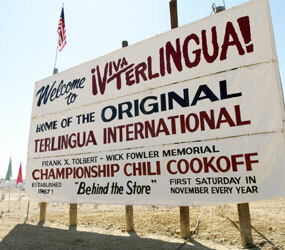 Terlingua is the proud home of the historic Chisos Mining Company, the original Chili Cookoff (both of 'em), Carroll Shelby's Championship Terlingua Racing Team, and the world famous Terlingua Trading Company (that's us). 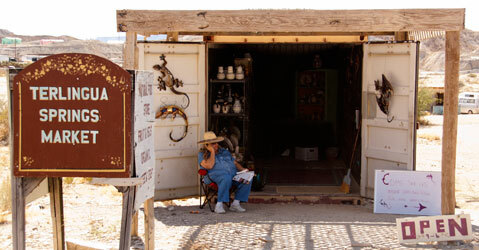 The recent 'gentrification' of downtown Terlingua has brought visitors to our thriving urban center -- and indoor plumbing, too. 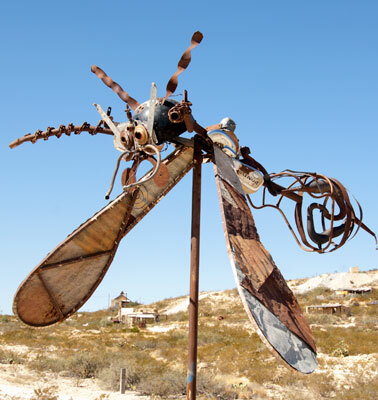 "Terlingua Proper" has a population of several dozen, counting the living residents of the Ghost Town, plus a few neighbors (and anyone driving by on their way to the Big Bend National Park (northbound) or the Big Bend Ranch State Park (southbound)). 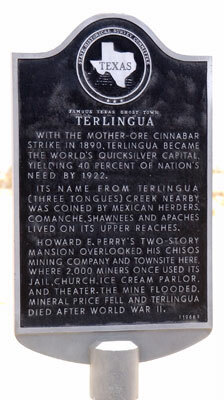 There is also "Greater Metropolitan Terlingua" which extends out to Study Butte in one direction and Lajitas in the other, to the Rio Grande and upper Mexico. 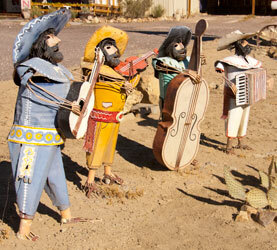 Local dining spots abound and area shopping is always an adventure, whether you're looking for souvenirs or fine art. 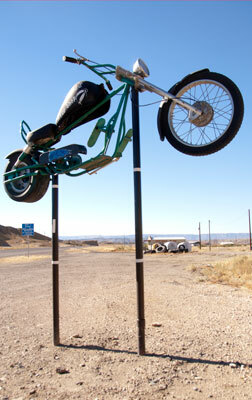 "Rush Hour" in Terlingua. Enjoy. Look both ways. 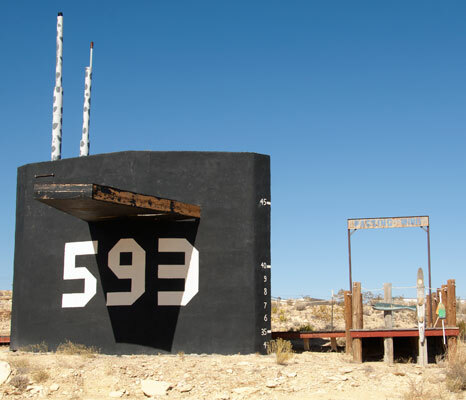 With all the roadside attractions, sometimes it seems like Las Vegas in the desert -- a REAL desert -- and thus the popular "Viva Terlingua" bumper stickers and reported sightings of Elvis singing in the cemetery. 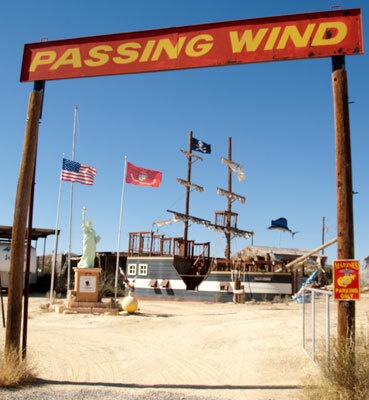 You'll find everythng from a pirate ship to a sand-locked submarine and the Statue of Liberty -- not to mention a few weird things that defy explanation beyond perhaps Terlingua's friendly "Beer Drive-Thru." 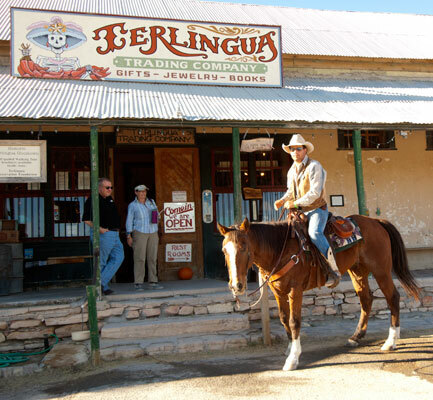 Just to be absolutely clear -- Terlingua has no Walmart, no Starbucks, no McDonalds, no Four Seasons Hotel, no Spagos and -- unlike every other town in Texas -- no Dairy Queen or Radio Shack. 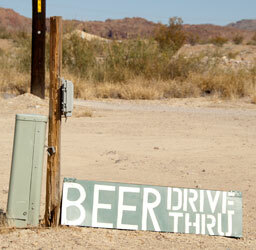 They're all fine establishments, but they can't cut it in Terlingua. 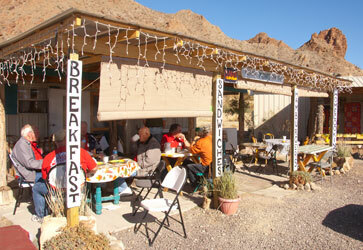 It's not that we don't like franchises -- but in Terlingua when you go out to eat, you can look the owner in the eye. 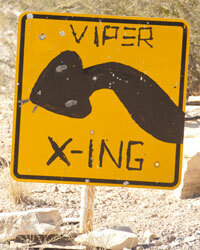 That means he or she will try a little harder to make your visit a pleasure.